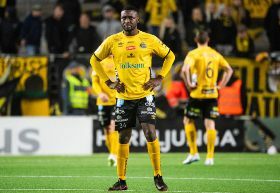 Super Eagles striker Chinedu Obasi is proving that he has not lost his Midas touch after scoring for Elfsborg in a 4-2 loss to Sirus in the latest round of matches played in the Swedish Allsvenskan. His 22nd minute goal meant he has been directly involved in 5 goals (3 goals and 2 assists) in his last seven matches in the Swedish Allsvenskan. Obasi was handed the penalty taking duties after Per Frick was felled in the box and sent the goalkeeper the wrong way to double his team's advantage. Moses Ogbu did well to ignite the comeback, scoring in the 34th minute to make it 2-1. He tapped in from close range after substitute goalkeeper Olsson spilled the ball into his path. On 62 minutes, Ogbu provided the assist for Sirus's third goal scored by Mohammed Saeid then bundled the ball into the net for his team's fourth following a goalmouth scramble on 72 minutes. With five games to the end of the 2018 season, Elfsborg sit 11th on the table with 25 points, two ahead of 13th-placed Sirius.